Yesterday Tablet Magazine posted an article about the ongoing Robert Mueller investigation. The magazine has a unique take on the investigation and cites numerous events that illustrate why they drew the conclusions they did. News that special counselor Robert Mueller has turned his attention to Erik Prince’s January 11, 2017 meeting in the Seychelles with a Russian banker, a Lebanese-American political fixer, and officials from the United Arab Emirates, helps clarify the nature of Mueller’s work. It’s not an investigation that the former director of the Federal Bureau of Investigation is leading—rather, it’s a cover-up. The group behind the goals of this investigation are counting on the American people to get bored and stop paying attention. They are also hoping that we are not asking questions about the cost and strange direction the investigation has taken. Mueller presumably knows whether Prince’s name was indeed unmasked and then leaked to the press—and that the leak was a crime. Mueller certainly knows that most of the case he has regarding Russian interference in the 2016 election was built by abuses of the foreign intelligence surveillance apparatus and other related crimes that are punishable with jail time. The identity of Trump’s short-tenured National Security Adviser Michael Flynn was swept up and leaked to the press in the same way as Prince’s. It was leaked to the same newspaper, the Washington Post. 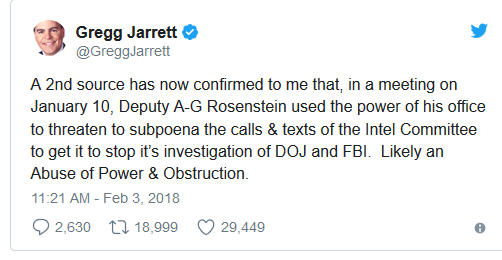 As I explained last week, the identity of Attorney General Jeff Sessions was also unmasked from intelligence intercepts and leaked to the Washington Post. The fact that the FBI had secured a Foreign Intelligence Surveillance Act warrant on Carter Page was also leaked to the Post. The warrant on Page was secured on the basis of the findings in the Steele dossier, an unverified piece of opposition research paid for by the Clinton campaign and Democratic National Committee. The purpose of the Mueller inquiry is therefore not to investigate the mostly ludicrous-seeming charges in the Steele dossier, but to protect the institution of the FBI, former colleagues, as well as the national security surveillance system. Therefore the inquiry has to cover up the sinful origins of the collusion narrative itself—which was born in repeated abuses of power and subsequent crimes committed by US officials in the intelligence bureaucracy and the Obama administration. Please follow the link to read the entire article. It reveals some of what President Trump is up against in trying to reclaim America for the average American. The swamp is deep, and there will be a lot of resistance to cleaning it up. Hopefully there are enough honest people in Washington to get the job done. It is time for some people to be fired and arrested. It seems as if there were some major infringements on the privacy and civil rights of American citizens during the last year or so of the Obama Administration. Fortunately, it looks as though these violations will be investigated and the guilty parties will be held accountable. The Washington Free Beacon posted an article today about the ongoing investigation into the unmasking of the names of American citizens who were named in classified intelligence community reports. Oddly enough, many of these citizens were associated with the Donald Trump campaign for President or his transition team. This is NOT politics as usual. The unmasking of American citizens and then leaking classified information is an example of using a government position for political purposes. Not only is it illegal, it is a danger to our republic. Stay tuned. Even if the mainstream media ignores this story, you will be hearing more about this in the future. President Obama has been relatively quiet since leaving the White House, but that doesn’t mean that he doesn’t have people representing his interests in the Democratic Party and the media. What are his interests? The main one is preventing President Trump from undoing his executive orders and other policies that were put in place that were not helpful to the American economy. On Saturday, The New York Post posted a list of recent Presidents and the economic growth under each. There are some real questions as to the methods former President Obama and those who supported him plan to use to prevent President Trump from taking actions to improve the economy. It is becoming obvious, however, that one of those methods is to attempt to delegitimize President Trump. So far the attempts to do this have included bogus information accusing President Trump of strange activities while visiting Russia, a claim that the Electoral College is unfair, and a charge that the Russians helped President Trump win the election. So far the only success these people have had has been the destruction of General Flynn and the withdrawal of one of the President’s cabinet nominations. However, we shouldn’t conclude that they are anywhere near giving up. Sometimes the best laid plans backfire. An illustration of that is found at Bloomberg.com today in an article by Eli Lake. Oddly enough, these conversation involved members of the Trump transition team and contained information that would be of value politically. The article also points out that Susan Rice has publicly denied any knowledge of President Trump’s transition team being caught up in intelligence collection. I would like to remind everyone that Susan Rice’s record on honesty is not spotless. This scenario is an illustration of the nightmare those who opposed the Patriot Act saw coming–the intelligence community being used as a political weapon. The problem is not entirely with the Patriot Act; part of the problem is unethical politicians who do not understand that they are also required to abide by the law and follow the Constitution. The Fourth Amendment rights of a number of people were violated by the actions of the Obama Administration. Those responsible need to be brought to justice.